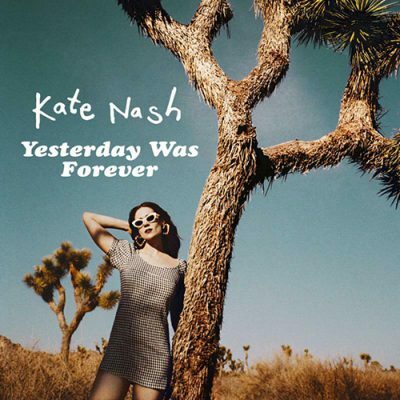 ‘Yesterday Was Forever’ is Kate Nash’s fourth album and the first since her self-released 2013 LP ‘Girl Talk’, which she put out in a blaze of glory after being dumped by her record label via text. Nash’s history involves a helluva lot of highs and lows, as the youngest, loudest, sharpest new British ingenue back in 2007, she was launched as a major label product. A BRIT school graduate, she started writing pop aged 14. Those songs went on to inform her #1 record and Brit-Award gleaning debut ‘Made Of Bricks’. She sold-out huge gigs. It was a whirlwind; not one that always felt comfortable. At 20, she rebelled, changing tack on album two. Channeling Kathleen Hanna and riot grrrl punk, she made the far less commercial album ‘My Best Friend Is You’ (2010), while also having her high-profile relationship be subjected to intense media scrutiny, it was ultimately a career shifting time. Now aged 30, Nash finds herself in a great place, she’s rediscovered her love for pop, launched a stellar acting career, (currently starring in the female wrestling series ‘GLOW’) and found communities of intersectional activists and progressive new voices to get involved in. For her, ‘Yesterday Was Forever’ is a phrase straight out of a teenage diary and it contains smatterings of ’90s pop-rock (Meredith Brooks, but also The Cranberries, Annie Lennox, Alanis Morissette and similarly forthright yet positive femme rock), alternative dance numbers, and spoken-word confessionals. This entry was posted in Featured Album and tagged kate nash, life in pink, yesterday was forever.